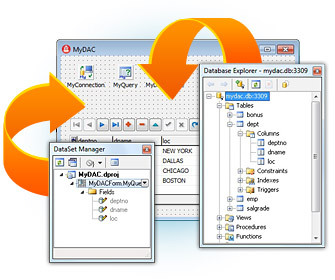 MyDAC (Data Access Components for MySQL) is a library of components that provides direct access to MySQL database servers from Embarcadero RAD Studio XE7/XE6/XE5/XE4/XE3/XE2/XE, Embarcadero RAD Studio 2010, CodeGear RAD Studio 2009/2007, Borland Developer Studio 2006, Turbo Delphi Professional, Turbo Delphi for . NET Professional, Turbo C++ Professional, Borland Delphi 2005, Borland Delphi 7/6/5, Borland C++Builder 6, Lazarus 1.2.4 and Free Pascal 2.6.4 for Windows, Linux, Mac OS X, iOS, FreeBSD for 32-bit and 64-bit platforms. MyDAC, a high-performance and feature-rich MySQL connectivity solution, is an efficient native alternative to the Borland Database Engine for direct access to MySQL. The capability to develop applications using the cutting-edge IDE for all the supported target-platforms: Win32, Win64, Mac OS, iOS, and now - Android. MyDAC gives its users an opportunity to establish Direct Connection and get the fastest data access to databases. -Direct access to server data.